Anthony Mancini was an eyewitness to the carnage left by the Japanese attack on Pearl Harbor 68 years ago. Editor's note: Every weekday, CNN focuses on a handful of people in the news. This is a chance to find out more about what they've done -- good or bad -- what they've said, or what they believe, and why we think they're intriguing. Mancini was a radio operator aboard the cruiser USS Minneapolis 68 years ago today. 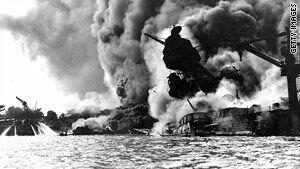 The ship was on its way back to Pearl Harbor, Hawaii, when Mancini heard "This is no drill!" over and over on the radio, he told the Palm Beach [Florida] Post. The sailors returned to find "six inches of fuel oil on the water and bodies everywhere." Today, Mancini, now 93, and other veterans will be honored when a new monument to Pearl Harbor is unveiled at Bicentennial Park in Boynton Beach, Florida. Some 2,400 U.S. troops died and over 1,100 were wounded during the Japanese attack, which marked America's entrance into World War II. The New York Times published an extensive article on Sunday examining how President Obama made his Afghanistan troop surge decision. From the story: "Mr. Obama had read 'Lessons in Disaster,' Gordon M. Goldstein's book on the Vietnam War. The book had become a must read in the West Wing after Mr. [Rahm] Emanuel had dinner over the summer at the house of another deputy national security adviser, Thomas E. Donilon, and wandered into his library to ask what he should be reading." In his book, Goldstein examined the essential lessons of America's involvement in Vietnam, considered the uses and misuses of American power, and offered "instructive guidance that we must heed if we are not to repeat the mistakes of the past." The Episcopal Diocese of Los Angeles has elected the first women as bishops of the diocese in its 114-year history. Rev. Glasspool is also the second openly gay bishop in the global Anglican fellowship since the church lifted a ban that kept gays out of its highest ordained ministry. The ban was designed to keep the worldwide Anglican Communion from tearing itself apart. Overturning that ban widened the divisions between Episcopal liberals and conservatives. Archbishop of Canterbury Rowan Williams, spiritual leader of the world's 77 million Anglicans, said that the choice of Glasspool raises "very serious questions." For 32 years, he was known to football fans as the Barrel Man. McKernan, snow or shine, showed up enthusiastically and emphatically underdressed at Denver Broncos games, wearing only a barrel held up by suspenders over his shoulders. It started as a $10 bet in 1977, when McKernan boasted that he could get on TV during a game. He died on Saturday at the age of 69 after a long illness.